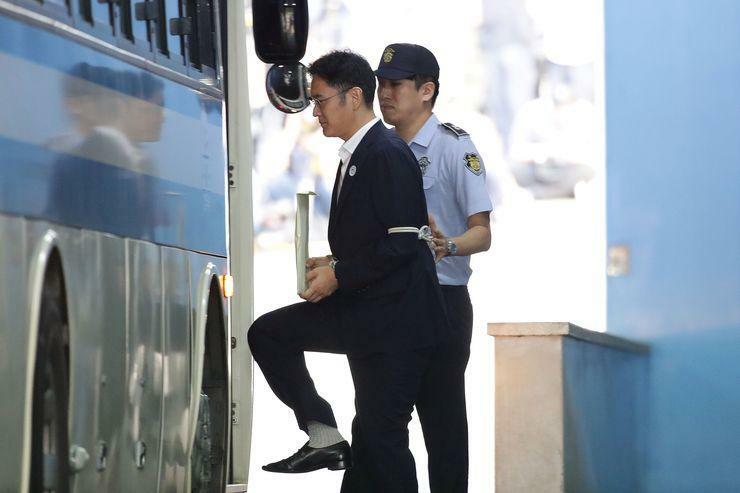 The heir to South Korea's Samsung Group appeared in a packed court on Thursday, 12 October, for the first day of arguments in the appeal of his five-year jail term for corruption. The 49-year-old Jay Y. Lee was convicted by a lower court in August of bribing former president Park Geun-hye to help strengthen his control of the crown jewel in the conglomerate, Samsung Electronics, one of the world's biggest technology companies. The appellate court hearing the appeal is likely to try to rule on the case by next February, legal experts said. Whichever side loses could take the case to the Supreme Court, the final court of appeal in South Korea. Lee's presence marked his first public appearance since the August ruling. He did not speak during the early proceedings other than giving his birth date and address. The lower court in August had ruled that while Lee never asked for Park's help directly, the fact that a 2015 merger of two Samsung affiliates did help cement Lee's control over Samsung Electronics "implied" he was asking for the president's help to strengthen his control of the firm. The defense strongly challenged the lower court's logic that Lee's actions "implied" solicitation for help from Park by providing financial support for the former president's close friend and confidante Choi Soon-sil. The prosecution, which has lodged a cross-appeal against the lower court ruling that found Lee innocent on some charges, said the court's decision to not acknowledge explicit solicitation for Park's help from Samsung despite the evidence found "did not make sense". The defence, which spent much of its time during the initial trial refuting the prosecution's individual charges, is expected to focus on a few key arguments in the appeal - including whether there was in fact an "ordinary type of bribery" as defined under South Korean law, which says only civil servants come under the statute. Park's friend Choi was not a civil servant. The lower court found that Samsung's financial support of 7.2 billion won (US$6.27 million) to sponsor the equestrian career of Choi's daughter constituted an ordinary type of bribery, as "it can be considered the same as she (Park) herself receiving it." The defense is expected to strongly challenge this by saying that the prosecution, on whom the burden of proof lies, has not proved collusion between Park and Choi.